The crowd at this year’s Unley Gourmet Gala 2015 has been reported as a whopping 30,000-plus.This is a massive 5o% increase on last year’s Tour Down Under Gourmet Gala. The City of Unley has now staged this event on King William Road for 15 years. With this much experience we have clearly got it right and are the envy of the Tour Down Under participants. I must say I was surprised that the attendance was 50% greater than we have previously experienced because each time I walked the street there was room to move. I remember times when you could not move. Looks like we have got it so right that there is room to move and enough room to allow 50% more people to experience what is a premier event. The eateries did mega business. I offer congratulations to everyone who helped make this the success it clearly was including the businesses who sponsored the event, the council management and staff who are responsible for the logistics and marketing of the event, the performers who entertained the masses and restaurant, cafe owners and service clubs who wined and dined us. To get a feel of what was on offer check out my Facebook page for a pictorial portrayal of the night. 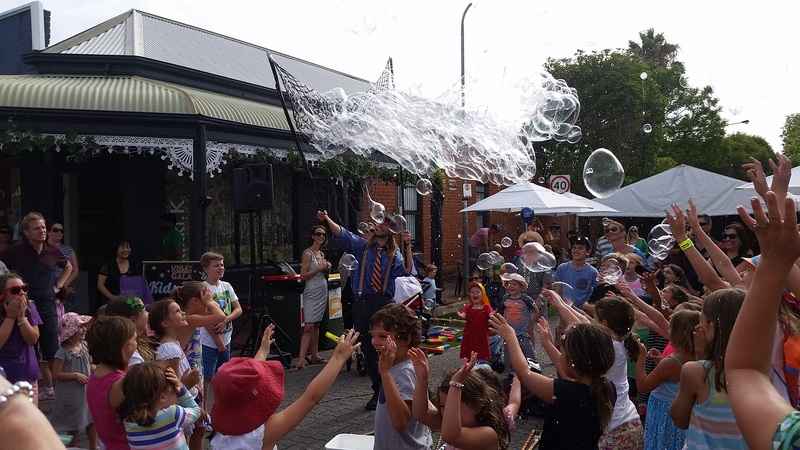 My favourite pictured below (as I believe was the younger citizens and older citizens alike favourite) was the Bubble man. Check out also the photos I posted of the following mornings stage 2 Tour Down Under 2015 race start.